The Collection: Remington Portable 2 In the series "The Collection", published every Friday‚ we present the typewriters collected by maschinengeschrieben.blogspot.com. 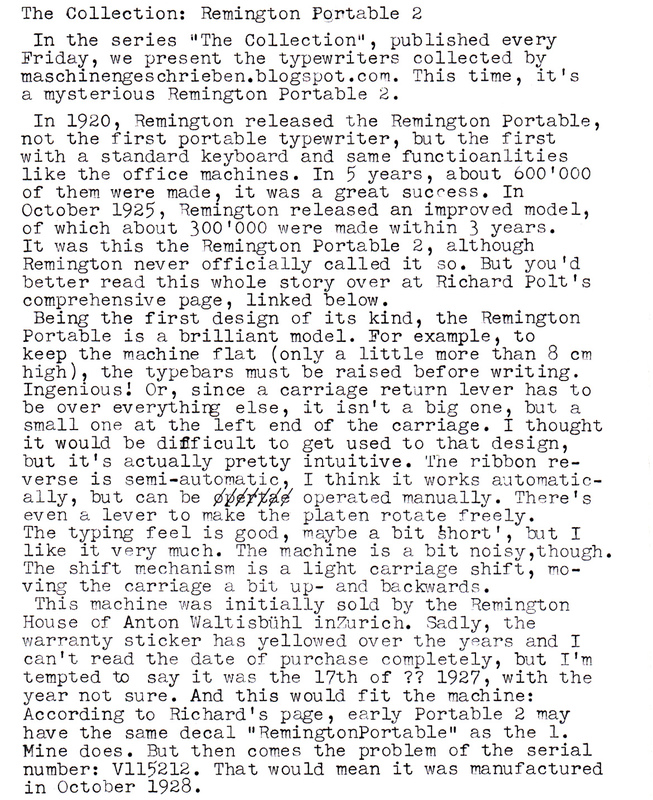 This time‚ it's a mysterious Remington Portable 2. 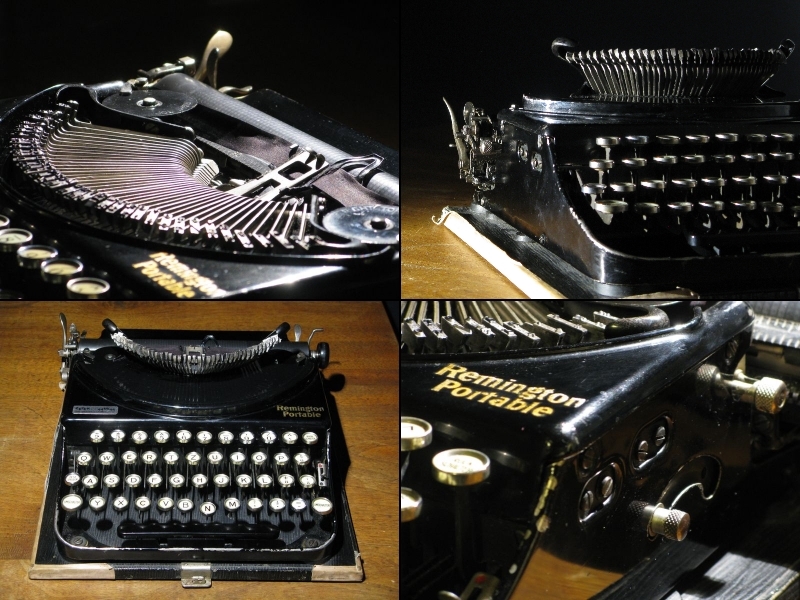 In 1920, Remington released the Remington Portable, not the first portable typewriter, but the first with a standard keyboard and same functioanlities like the office machines. In 5 years, about 600'000 of them were made, it was a great sucress. In October l925‚ Remington released an improved model, of which about 300'000 were made within 3 years. It was this the Remington Portable 2, although Remington never officially called it so. But you'd better read this whole story over at Richard Polt's comprehensive page, linked below. 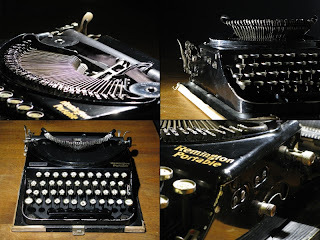 Being the first design of its kind, the Remington Portable is a brilliant model. For example‚ to keep the machine flat (only a little more than 8 cm high)‚ the typebars must be raised before writing. Ingeniousl Or, since a carriage return lever has to be over everything else, it isn't a big one‚ but a small one at the left end of the carriage. I thought it would be diﬂficult to get used to that design‚ but it's actually pretty intuitive. The ribbon re- Verse is semi-automatic‚ I think it works automatis- ally‚ but can be apyyygy operated manually. There's even a lever to make the platen rotate freely. The typing feel is good, maybe a bit short', but I like it very much. The maohine is a bit noisy‚though The shift mechanism is a light carriage shift‚ mo- ving the carriage a bit up- and baokwards. This machine was initially sold by the Remington House of Anton Waltisbühl in?urich. Sadly, the warranty sticker has yellowed over the years and I can't read the date of purchase completely, but I'm tempted U> say it was the 17th of ?? I927, with the year not sure. 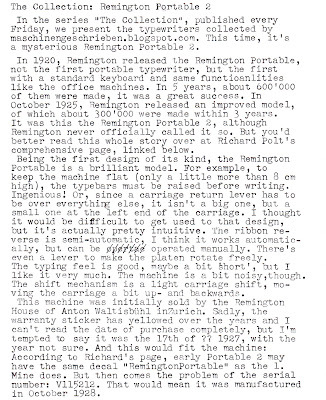 And this would fit the machine: According to Richard's page, early Portable 2 may have the same decal "RemingtonPortable" as the l. Mine does. But then oomes the problem of the serial number: Vll52l2. That would mean it was manufactured in October 1928. Very interesting typewriter. Serial numbers can cause confusion as I found out with an old Underwood portable I have. The carriage my Noiseless Model 7 locks the same way. The one located in Tobel ending tomorrow? That's a very interesting one, apparently a #2 with the typebar guards, but with every kind of #1 decal one could imagine. It seems to be a delightful typewriter! I would love to try one :) My collection is fairly small for now and I still did not dare to buy something so ancient. But perhaps it is time to take risk. As you might know, typewriters are almost indestructable. 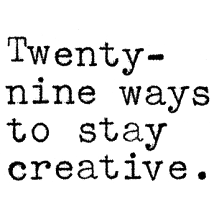 :) And often, the old ones are better-made than the late ones. For example, I'd definitely prefer anything from my collection from pre-1950 over anything post-1970. If you can get a Remington Portable for a reasonable price (I paid 10 CHF for this, another one just sold for 21 CHF on ricardo, the swiss auction site, today). Thanks for the link to this post, I hope you don't mind another really late comment. I tried re-activating the carriage lock based on your suggestion but it doesn't work. It is stuck. Oh well.